The other day I showed you the pictures of a chair that a client brought to me to reupholster. Her cat had a love hate relationship with this chair in that it loved to sleep on it but obviously hated the looks of it. 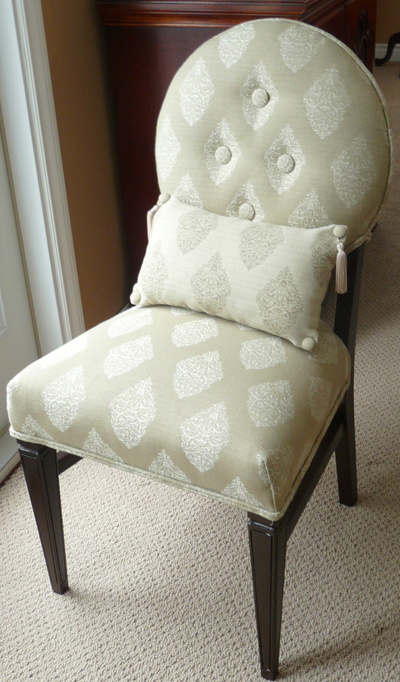 Buttons were missing, stuffing was flat, lumpy and non-existent in parts but overall this chair had simple elegant lines that the client wanted to add back to her contemporary decor. 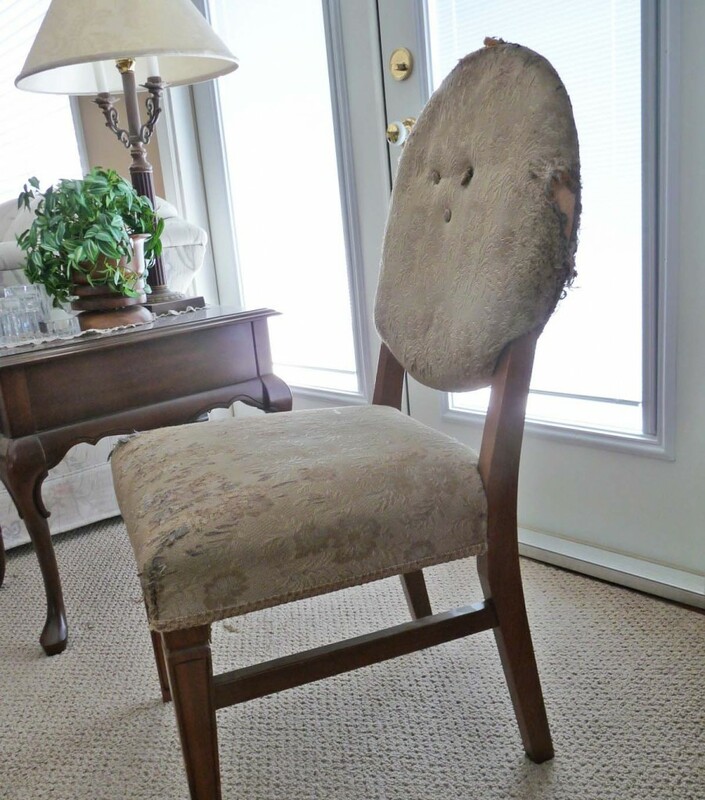 Stripping the chair down to the “bones” was the easiest way to restore it. Woodwork was painted (oil) and spray varnished without the worry of fabric or stuffing getting in the way. Springs were retied and I added webbing front and back to the back rest as it was important to have a stable surface for attaching the heaps of padding that I added, particularly to the back. I like to over stuff as it is easier to sculpt a “Reubenesque” roundness which I equate with comfortable and a more expensive look. 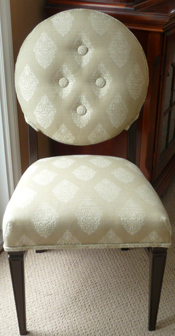 If you look closely at the fabric, the pattern is centered and matched from the seat to the back rest. 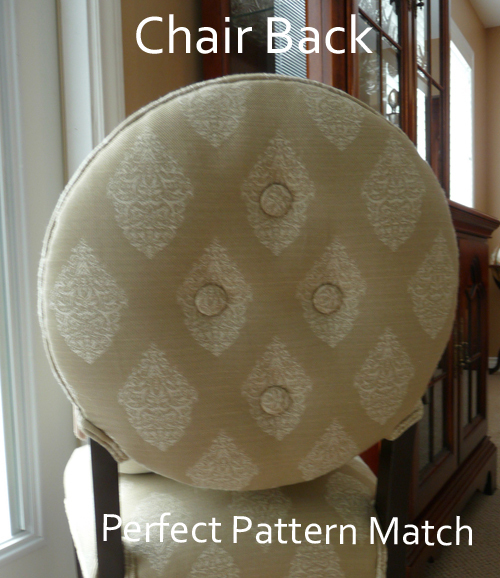 Both sides of the backrest are perfectly identical in pattern placement so that buttons in the front and back of the chair are in exactly the same part of the pattern. I love bias cut, double welting as it adds such a tailored, custom look and worth the extra fabric it takes to produce it. I would consider this project to be a little more advanced than beginner’s level, say intermediate. Including the cutting for the welting it used just under 3 yards and could have been less if there was not a pattern match to be concerned about. The little chair pillow was an afterthought and a small gift for the client. I reversed the fabric, tabbed the ears with buttons and added miniature tassels. Voila! I’d love to hear what you might have done differently or about any projects you have done as it is always a learning opportunity for me too. Beautiful work, Christine. You’re a such an incredible talent. Christine, pattern match is absolutely crucial to good upholstery. When the pattern is not matched, it just jumps out at me like a red flag. You did a great job on the chair! Glad I made your day, Christine. I always appreciate when an artisan goes the extra mile to make sure the design is perfect! Wow, that's quite a transformation!